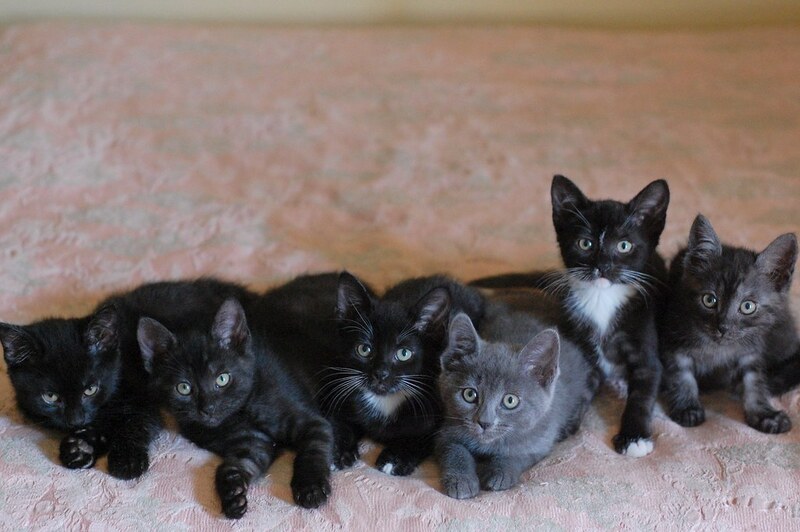 The Itty Bitty Kitty Committee: Finally! A Family Portrait! I've been trying since they moved in... and finally, everyone sat still just long enough for a couple of group shots. I just want to wrap my arms around the whole bunch for a squirmy kitten hug fest! Wow, so dark and beautiful. The tonal opposite of the litter that was all orange and white - was that Lovejoy? Oh my gosh, what a beautiful bunch! I have no clue how you manage these group portraits. Herding kittens is a lot harder than herding cats! Being an avid follower of IBKC, I'm starting to treasure the shared scenery of all these kittens, whether it be the pale pink floral bedspread, the bright orange towel, the occasional green sweater, the sofa with grooves, the window seating, and of course, on Craig. 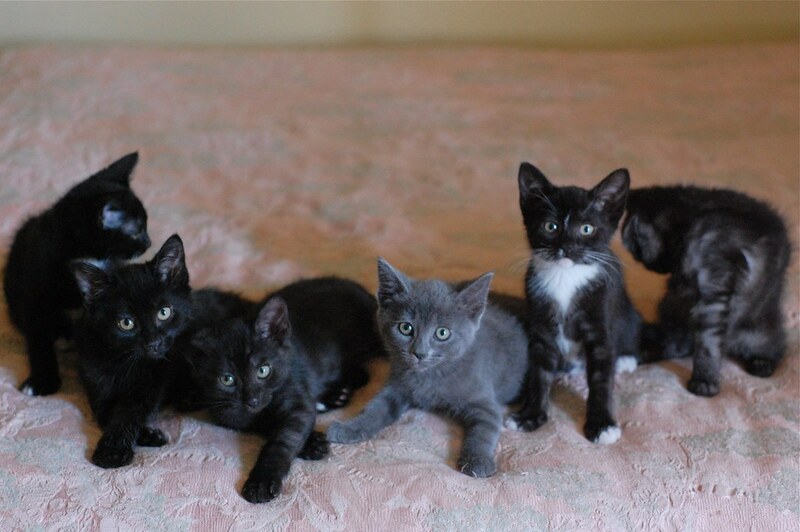 All these kittens are so lucky to have the love of you, Craig, and Charlene. Thank you for sharing them with us! So worth the wait! They are such a beautiful bunch! Oh that is just too cute. Mama says you must be magician to get kittehs to stay in the one place long enough for photos. Photo's of me and Harry together are very rare. Oh my - the wait was indeed worth it! These are going to be some gorgeous adult kitties based on their looks now! 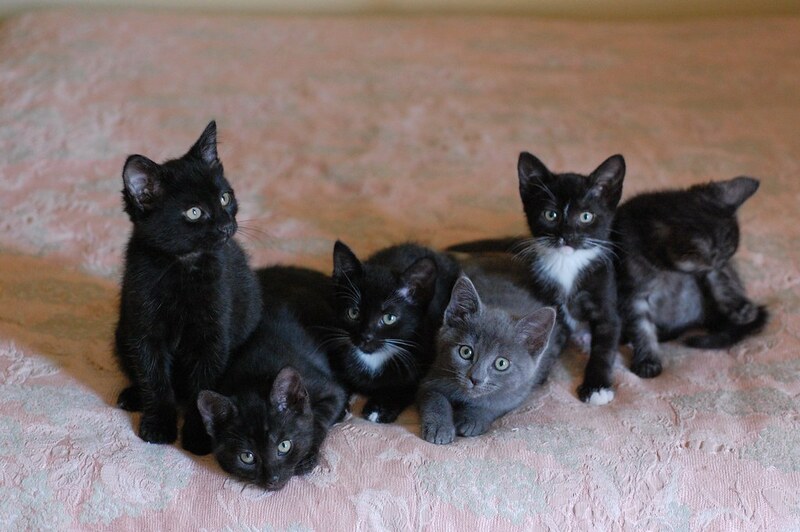 That is one powerfully adorable litter of kittens. *psst* Pia, stop grooming yourself and look at the camera! You want to look good in case your new family is watching! Those are so beautiful!!! That must have been hard work to get all of the kittys lined up at one time!!!! I love it!!!! Laurie, you always do the best group shots! I know you've shared your secrets, but nobody does it like you do. I will just go expire from the cute now! Love the photos! Think the first one is the best. Oh how I just want to scoop them all up. Mom said she thinks yoo deserve a medal for getting all those little cuties to sit still long enuff for a group photo! It's adorable. OK, now everyone say ... wait a minute. What does everyone say? OK, all together now! LOOK CUTE!. Good, that's good. I am madly in love with this litter. I'm a sucker for little black kitties and tuxes are my absolute favorites. 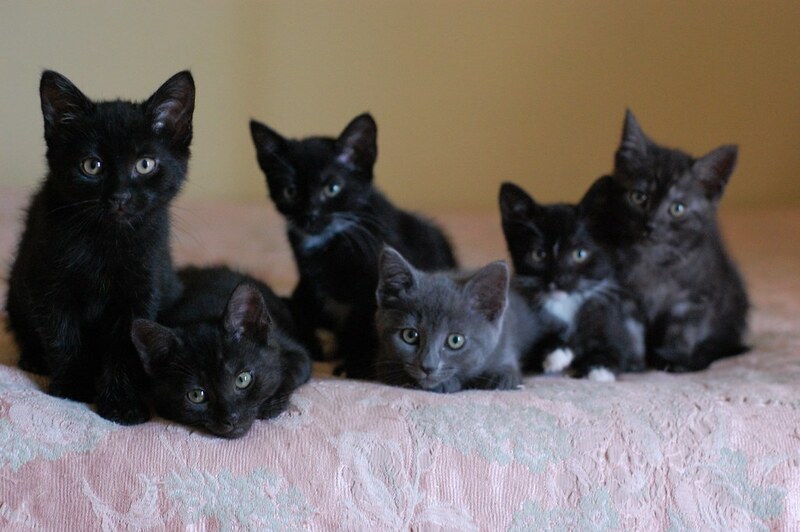 I hope their new adopters keep in touch and send pictures of them when they're all grown up! 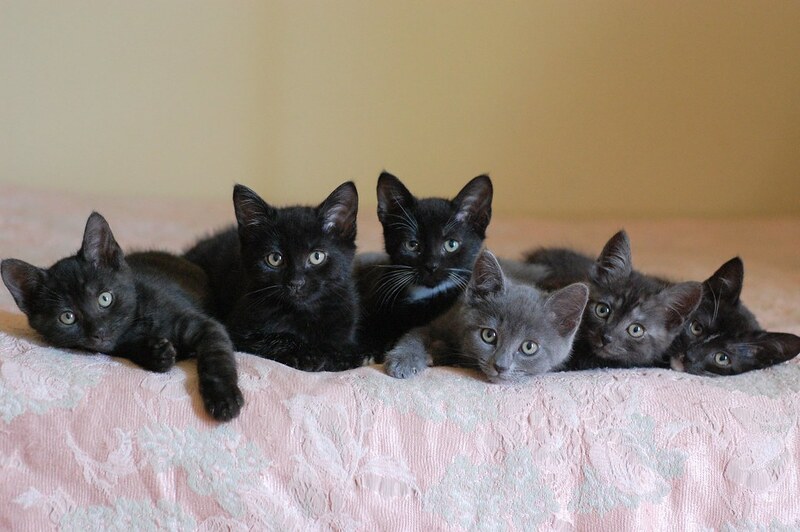 That's a lot of kitties to stay still at one time!!! Good job!!!! They look like the Kitten Mafia! I have no idea how you accomplish these!! Marjorie... timing is everything. You just got to get them when they're starting to settle down.